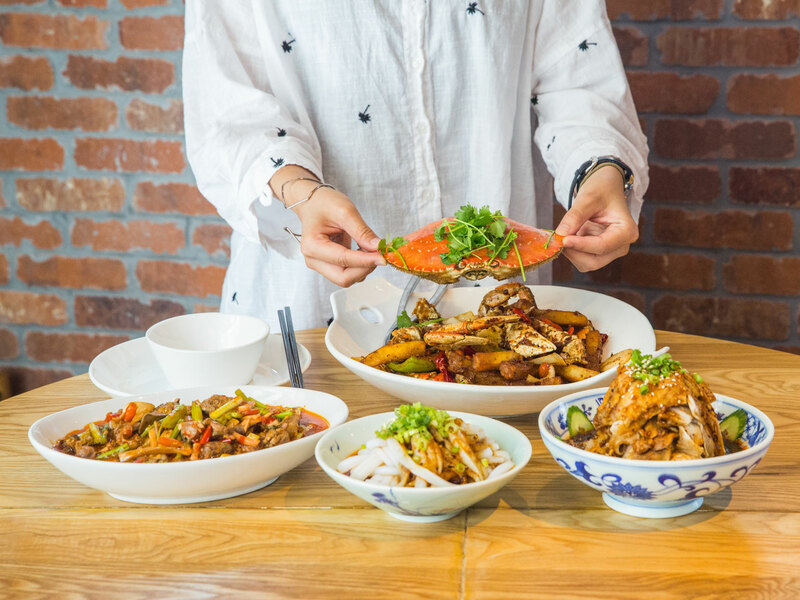 The fact that Tiantian Qiu has become a local sensation by cooking crab and lobster with Sichuan flavors tells you a lot about who she is. Chef Tiantian Qiu is thinking about what she wants to name her forthcoming Westside restaurant on Sawtelle Boulevard. She’s hoping to open the hot-pot spot in the middle of February, which means she’s working on it while also celebrating Chinese New Year with an elaborate special menu at Hip Hot, her Sichuan seafood restaurant in Monterey Park. 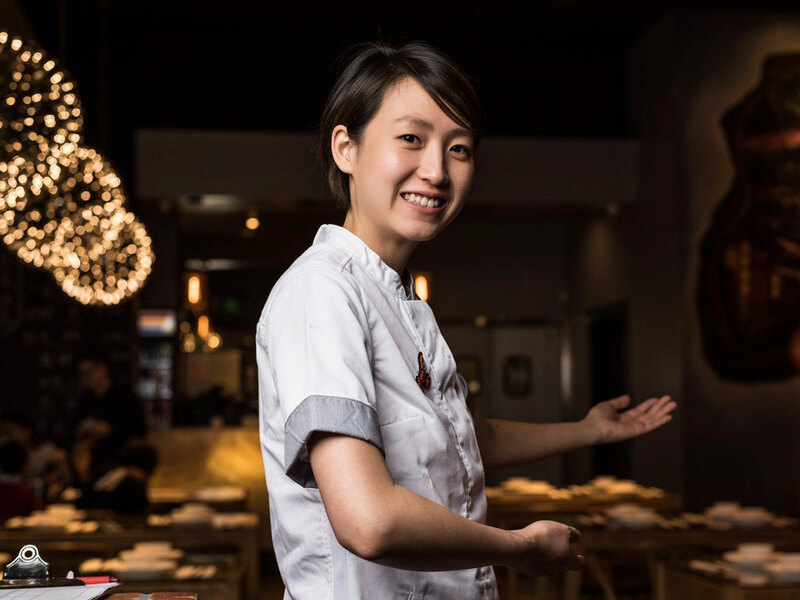 The fact that Qiu has become an L.A. sensation by cooking crab and lobster with Sichuan flavors tells you a lot about who she is. The Sichuan province where Qiu spent most of her childhood is, as Jonathan Gold pointed out in his glowing review of Hip Hot, land-locked. Sichuan cuisine is not known for seafood. The strong-willed, Chengdu-born Qiu doesn’t care. Qiu’s trained at all kinds of Chinese kitchens and is deftly weaving in Cantonese elements with the mala and other pyrotechnics of Sichuan food. She’s an important new-school chef building her own chile-laden path in L.A., a city that embraces bold mash-ups from genre-defying chefs. Given that what Qiu likes to do can be somewhat hard to classify, it’s understandable that she and co-owner Kai Lin have been having discussions about what to call their Sawtelle restaurant. The frontrunner is Mala Town, partly because “town” sounds a little like the Chinese word for soup, though friends have told Qiu that it doesn’t represent the range of the restaurant, which will serve a lot more than Sichuan hot pot. The 1,200-square-foot restaurant with a patio will serve Cantonese-style, Mongolian-style, and some other regional styles of hot pot. There will be about eight options at the beginning, including seafood, beef, lamb, and a chicken-coconut soup base. 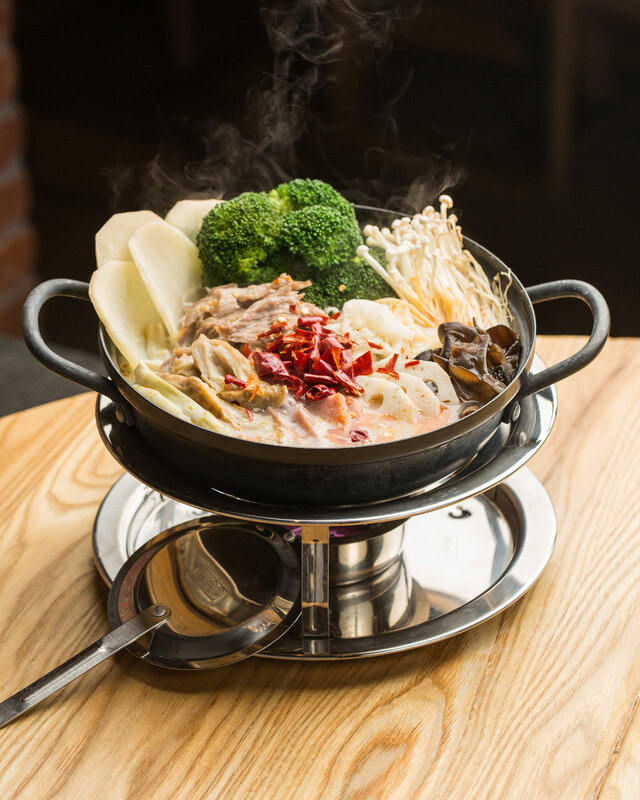 Each guest will get an individual-sized hot pot. Qiu says it’s somewhat like hot-pot chain Boiling Point, but there’s an important difference. You cook the meat and then try the soup. Then you put in vegetables and try the soup again. Then you put in noodles or potatoes and try the soup again. It’s a meal that’s about enjoying nuance and building flavors. Qiu, Lin, and close friend Ivy Wei, an L.A. Chinese-restaurant veteran who started as a Yang Chow cashier and went on to open Fat Dragon in Silver Lake, run through some other names being considered. Maybe Hip Pot is a good option. Maybe the name should emphasize how everybody gets their own hot pot. But ultimately, Qiu seems to like Mala Town. It would attract people who want Sichuan food, which is trending in L.A. and beyond. We’re having this conversation during a bizarre week in Los Angeles with the LAUSD teachers’ strike, the government shutdown, fierce rainstorms, and a power outage that made us move our meeting from Chinatown’s Endorffeine coffee shop to Hip Hot. Businesses at Chinatown’s Far East Plaza like Endorffeine and Howlin Ray’s had no choice but to close for a day. Qiu mentions how Endorffeine’s Jack Benchakul realized all he could do was go home and try to enjoy a break from work. It kind of feels like when you’re in college and class is canceled, Qiu says. Qiu, you see, is a full-time chef who’s also a full-time student, even though she already has a business degree from USC and a thriving career. She came to America 10 years ago for college. Now, she’s studying interior design at UCLA Extension because renewing her student visa has allowed her to stay in L.A. Wei, who’s spent many nights at Hip Hot eating off-menu items and decompressing with Qiu after work, is in a similar situation. “It’s the only way,” says Wei, who’s at UCLA Extension studying digital marketing even though she graduated from Cal-Poly Pomona’s hospitality-management program and has plans to create her own fast-casual restaurant. Wei first connected with Fat Dragon restaurateur Allen Wong when she was cooking Taiwanese street corn and pan-fried dumplings at a Chinatown pop-up. Wei says she was just having fun that night and has never considered herself a professional cook, but Wong saw her potential and had her help develop Fat Dragon’s menu. (Fat Dragon was home to a dinner where Qiu served geoduck to Cheryl Burke and Graham Elliott for Bravo’s Going off the Menu digital show.) Wei now serves Fat Dragon’s food at many L.A. events and big festivals like Coachella, but she stresses that Qiu has a more intense schedule. Hip Hot, which serves lunch and dinner and doesn’t shut down in between, is open seven days a week. It doesn’t close until midnight five nights a week. It helps, at least, that studying interior design is relevant to her restaurants. She’s worked closely with a designer on the layout of her Sawtelle hot-pot spot. “For me, I think there’s only, like, two things I want to do for my whole life: cooking and design,” Qiu says. Cooking, Qiu says, was her only hobby before she decided to open a restaurant. At first, she thought she would be an owner/operator, but not a chef. She later realized she was most comfortable in the kitchen while Lin excelled at running the front-of-the house. Of course, this is a small independent business, so they sometimes end up doing everything at Hip Hot. When Qiu first started thinking about opening a restaurant, her parents weren’t excited, but she and Lin were determined to make it happen. “I told my parents, ‘If you don’t agree, there’s other people who have money, and we can do it with them,’” Qiu says. In the end, Qiu and Lin’s families both put money into Hip Hot. One of the restaurants served spicy crab. Another specialized in Sichuan snacks. Another was a high-end spot where Qiu learned about elegant plating. And she continued to learn at Hip Hot, where she brought in cooks from Sichuan and watched them. Qiu has confidence to spare and a work ethic to match. She’s also planning to open a restaurant in Arcadia. It will be somewhat similar to Hip Hot, but maybe only a third of the menu will be Sichuan. Qiu doesn’t want the menu to be any bigger than Hip Hot’s, even though she will showcase “more styles and regions” as she continues to remake Chinese food in L.A. I ask how many menu items she has at Hip Hot. And how many will she have at the Arcadia restaurant? I realize that, despite all the chiles and peppercorns that Qiu puts atop seafood, the most important fire at Hip Hot comes from within its chef. I believe her when she says her schedule is no big deal. Nothing about the process of staying in America or the trials of opening restaurants or attending school compares to how hard she pushes herself. For Chinese New Year, Qiu is offering a special 10-dish, $230-for-six-people feast from February 1 to 18. She’ll have dishes like smoky scallops, wok-cooked lobster in mala sauce, fish stew, crispy lamb bing, and eight-treasure rice. In future years, when she has more time, she might change her Chinese New Year menu daily to reflect how there are days of the holiday celebration that focus on specific foods like fish or vegetables or dumplings. There’s even a day where the goal is to have extra food because leftovers represent security. Qiu, given how busy she is, knows it wouldn’t have made sense for her to change the menu daily this year. But she does have a small regret. There’s a wryness when Qiu says things like this, like she knows she’s pushing herself hard. But she also understands better than most people that success and momentum require non-stop effort. Before I leave, I ask Qiu to share a Chinese New Year memory with me. Once, when she was five or six, she ate a dumpling that had a coin inside. The coin represented good luck, and maybe adults who knew where the coin was directed her toward that specific dumpling. “I remember after I picked that dumpling, my grandfather said, ‘You should study hard, you have a good future,’” Qiu says. She laughs when I ask what the coin tasted like. Wei mentions that a friend is about to have a dumpling party for Chinese New Year.